25 Orphans lost financial support! Mahboba’s brother, Sidiq Rawi in his recent trip to Afghanistan was shocked to discover 25 orphan children, in an abandoned orphanage. This orphanage was established by another organisation with funding provided by the Asia foundation to house twenty-five children between one and ten years of age. After the initial six months, the funding from the Asia foundation ceased. The orphanage was left dependent on individual donations, which was not enough to adequately provide for the children under their care and fairly pay the workers. For almost six months the orphanage was operating with no sources of funding, and relying on the workers to volunteer in combination with charitable food support from the local community. The children were left in appalling conditions; sleeping on floors with no blankets, old clothes with no possibility of school uniforms or shoes being provided, and becoming malnourished due to the irregularity of their food supply – with some children too weak to eat when they finally did receive a meal. 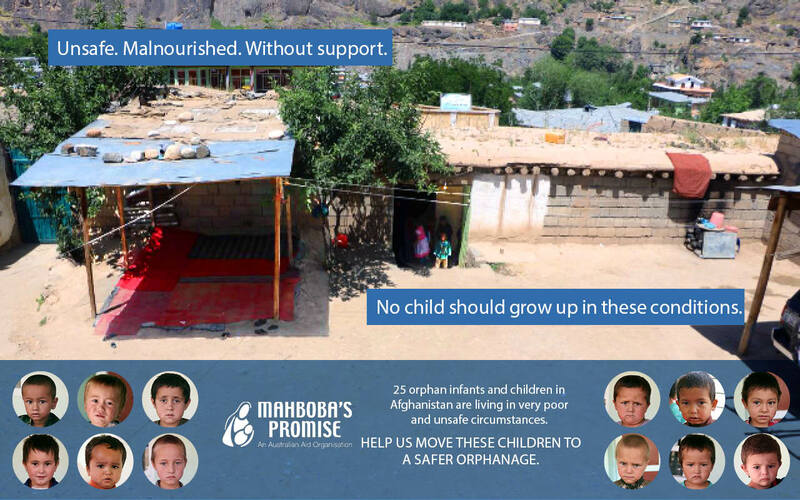 Drawn to action by the plight of the children, Mahboba’s Promise has come to an agreement with the other organisation to transition the orphanage into the operation of Mahboba’s Promise. To act instantly, and end the suffering of the children during the holy month of Ramadan, the organisation sent a representative to the orphanage to purchase food and meet their immediate survival needs. But this is not where our plans for the children end. In taking over operations of the orphanage, Mahboba’s Promise will cover the costs of renting the house, all operating expenses, the salaries of all workers including a principle, a night teacher, a supplementary teacher, a cook, two cleaners, and two security guards, in addition to providing all necessary appliances and supplies to convert it into a standard orphanage including kitchen supplies, pillows, mattresses, carpet, stationery, school uniforms, clothes and shoes for all the children. Our vision for the orphanage is to provide the twenty-five children, eight females and seventeen males, with education, accommodation, security, and well-being, as well as establishing a centre in Badakhshan province from which to present support to all children of the community.